Cheap return flights from Belgrade to Kathmandu, Nepal from €387! Star Alliance carrier Air Canada has just discounted non-stop flights between various European cities and Toronto. Very limited availability at the end of summer when departing from the UK (Manchester, Edinburgh, Glasgow), Dublin, Amsterdam, Paris, Lisbon or Milan. Fare is for a round trip ticket and inclusive of all taxes as well as checked bag. The cheapest non-stop flights to Toronto are available already for £262 or €305. Sale with Air Canada is available till 8th of February, the cheapest deals are when travelling in September 2018. In some cases you will also find non-stop solution in October and November. Below you will find our booking sample on each route as well as few travel options. If you need accommodation in Toronto we recommend Hotels.com or Booking.com. 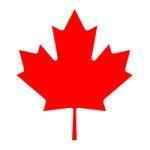 Booking sample of Air Canada non-stop flights Europe to Toronto from £262 or €305! 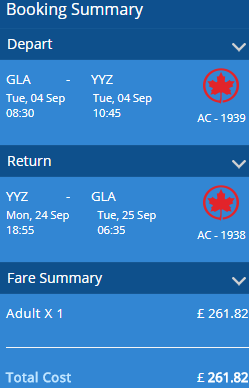 You would depart from Glasgow to Toronto on 11th of September. Your inbound flight from Canada back to the United Kingdom would be on 25th of September 2018.